I had fun doing the Day In The Life exercise last round, so I’m going to do it again. Welcome to a week in the life of a SUNY Collections and Technical Services librarian. Before work: Awake at 6:15, out of the house by 6:50, at the gym at 7, two miles of laps and my PT exercises, and then home by 8ish to shower, eat breakfast, put on makeup, and find all my work stuff — laptop, office keys, lunch foods, etc — and drive off to work. 9:40: Check and return voice mail and email, check Twitter, Bloglines, and Friendfeed. 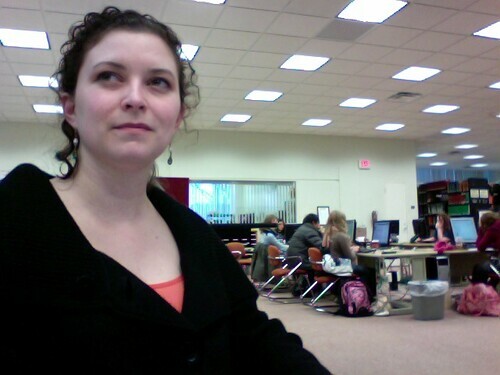 Use PhotoBooth to snap a DailyPic of myself to email to Flickr. Read a draft blog post and debate whether or not I want to change it before posting; leave as a draft. 10:40: Realize I forgot the power block/cord for the Macbook at home; rather than steal one from our shared laptops, email husband to ask him to deliver it at lunchtime. Move past this piece of forgetfulness, bestow blessings upon fully-charged Macbook batteries which give 4+ hours of charge at low screen brightness, and schedule a half-dozen meetings in our group calendaring software. 10:55: Update the Faculty Senate website for start of spring semester. 11:10: Give up on FS website, and take screenshots of messed-up login screen to email to PR folks with narrative of what I’ve tried to do to log in to the campus CMS, asking for troubleshooting help. 11:20: Email SUNY-ACQ listserv with reply regarding whether or not it is myth that we cannot sell discarded library books. (Myth!) Find and include emailed passages from high mucketymucks within SUNY who clarified said question in 2003 and 2005. Exchange email with colleagues about a possible student intern who wants to go on to graduate school for an MLS. 11:40: Cruise through FriendFeed and Twitter and discover that Neil Gaiman won the Newbery for The Graveyard Book. Squee like the fangirl I am; post it here. Strive to discover who won the Caldecott so that I know what will be coming in our Juvenile Awards approval plan, but give up on ALA’s website and go to lunch instead. 12-1:15: Lunch. With cake. Because it is my birthday today. Fortunately, the dining hall can always be counted on to have cake, and my husband can be counted on to provide power cords. 1:15: Email. Search Committee work. Find solution to campus CMS login problem (note: Solution is “stop forgetting step two in the process”). Get some thanks for answering the SUNY discards question. Receive information from a faculty member about the student requesting an internship. As I begin to tab away from Mail, another message comes in and I sit down to write a lengthy reply back to PR about the SUNY DSpace install and its utility as an archiving solution for campus administrative documents — minutes, reports, agendas, etc., and the Faculty Senate’s intention to collaborate with the library to pilot that implementation. 1:55: Back to work on Faculty Senate website. Finally. It’s an hour of work that matters quite a lot, because all my changes are accuracy edits, but which no one is likely to notice … thankless work, but important for that moment when it’s needed. 3:00: Reference shift until 6 pm. Now, at 4:16, I have answered one IM question about whether the New Grove’s is online and how to get to it, pointed at the stapler countless times, and directed a student to the photocopier. And I bought a peach iced tea from the cafe. Given the low desk traffic, I’m also writing an executive summary of the proposed changes to the Collection Development Policy for our next staff meeting. And when 6 rolls around, I’m going to order a pizza, go home, and watch disc 3 of Season One of Supernatural. Hahaha I love that you snap photos of yourself and send them to flickr! I also love that I’m not the only one who has to spend most of my ref desk time pointing to the staplers.